I’ve had a very islander week this week. Well as much as one can while living and working in a city. Before I tell you about the two wonderful events I went to this week, I’d like to mention one thing. Obviously, we all have our own personality traits which make up our own personality right? Whether it’s how we interact with others, how we handle stress, how we meet new people, what makes us laugh, what we believe in and and what we value. These things are most often defined by your own personality, your family, the people you grew up with, your friends, colleagues the list goes on. But what about when you meet a whole nation of people that are so similar to you? Yeah yeah, I get it, it’s genetics and all that other scientific stuff that I have no idea about but let me tell you, it’s the weirdest thing when you meet people that you realise have personality traits that are the exact same as you. For those people that don’t know me personally, let me give you a snippet of some of my characteristics. I’m very happy to play the fool for other people’s enjoyment. I’ve even been to clown school. Yes guys, I am officially trained to be an idiot. I laugh a lot. Generally it’s my first reaction to anything- especially when I’m in a stressful situation. I have a tendency to think it’s hilarious that we all seem to get in a tizzy over the smallest of things. I know, I know life can be stressful and I’m constantly apologising for when I keep reacting to situations with a burst of laughter. Except for when I confused curry powder with mustard powder when making a curry for friends – serving mustard korma is totally not funny. I sing all the time. And very often too loud and in too public areas. The first event I went to was a performance by Te Toa Matoa on Monday night. Te Toa Matoa are a Kiribati singing and dancing group made up from a disability group in Kiribati. Some are blind, missing limbs or both with another physical disability. My Dad had met them on the plane flying from Kiribati to Australia and I found out they were performing for the Darebin Music Fest in Northcote last Monday. I know this is going to sound horrible but as soon as they came out on stage – I laughed! It does sound horrible doesn’t it? They just looked hilarious coming out – blind men and women being led out on stage by a guy with no leg. It was then that I realised that I was the only one in the audience laughing. In all honesty, I meant it as no disrespect. Kiribati people (especially when performing) love making people laugh and really feed off audience interaction. Yes it was funny but also, because there were hardly any other Kiribati people in the audience, I suppose I laughed to make them feel welcome. To let them know that the audience would enjoy their performance. Of course they were welcome by the crowd (it was packed out and people were squashed in to the aisles) but I wanted to let them know that there were Kiribati people in the audience as well. Here are a couple of clips from the night. I loved watching them. All Kiribati people have a natural musical ear and this group sing in harmony and change keys just as easily as they can scale a fish. I found myself laughing, singing and doing lots of ‘wooohooo!!’s. The crowd loved it and because of this, Te Toa Matoa were enjoying themselves even more. I’m a trained actor and as much as I studied through uni, my main inspiration and teachers are the Kiribati people. They set the tone for the performance and leave audiences wanting more. Everyone one stage and in the audience leave afterwards having a good time. The performances show so much happiness on stage that you can’t but you feel happy watching. I don’t want to over analyse their performance too much (as much as I could harp on about it forever) because there is nothing complicated about it. It’s entertainment at its most simple – and in some way – most raw form. I spoke to some of the performers afterwards and said in the I-Kiribati language ‘Hello, I enjoyed your performance, you were very wonderful’. And the response I got? ‘Oh my god, the white girl is talking I-Kiribati’. Ha! We sat and talked for about 15 minutes, talking about which islands my grandparents are from and who my parents are. The woman I was talking to told me that she had left her 5 children back home to come here and perform. I told her she was very beautiful and she laughed. Sounds corny but when I left, I was grinning from ear to ear and as happy as I’ll ever be. This week, it really dawned on me how Islander I am and how much more connected to my culture I feel. I started this blog over a year and a half ago and the main reason was because I wanted to learn more about my culture. Being in the middle of Melbourne and watching a Kiribati performance has made me realise that I am achieving what I set out to do. Sure, I can’t speak the language fluently but I’m getting there. I’m understanding that some of my characteristics are not just some that I have conjured up myself but are from Islanders that have passed from generation to generation. They laugh, sing and love to play the fool. And I’m all too happy to carry on the family trait. And as a little treat for you guys, here is a video that my Mum took when flying out from Marakei back to Tarawa. From the window of the plane, you can see islander life on the side of the runway – everyone stopping and watching the plane go past. You also get a sense of how small the islands are, the runway is the only made road on the island and stretches just long enough for the small planes to land and take off. As soon as it’s up in the air, the island disappears into ocean. As always, thanks for reading. Your response really pushes me to find more material and keep writing. I really love it. Previous Post Aren’t we all the same? Another great post from you – really interesting (and funny!) to hear how you are getting on with your journey of discovery into your culture and self. I love the clips and the pics! You make me feel as if I am with you, sharing your experiences ;o) Look forward to more! And thanks for the link to Blackdot’s So Funkin Native – wow! – sounds like thought provoking stuff! Marita my love, went back to Marakei a week ago. No worries, no care, just the missing pieces of my Davies jigsaw puzzle family but one day, one day we will all be together once again somewhere, in Marakei, Tarawa but Sale is more likely soon for Christmas. Love the post. If I was with you at the Darebin Town Hall, I probably would laugh too not at anyone in particular but at the situation, the place and the time. It is what I call “the funny side of life” Don’t stop laughing Marita and you don’t have to apologise for being an I-Kiribati. Keep the posts coming. Love it. My name is Jenni Boyle and I am an editor at an educational publication called CultureGrams. We are currently trying to expand our Kiribati gallery section and would love to have you work with us. 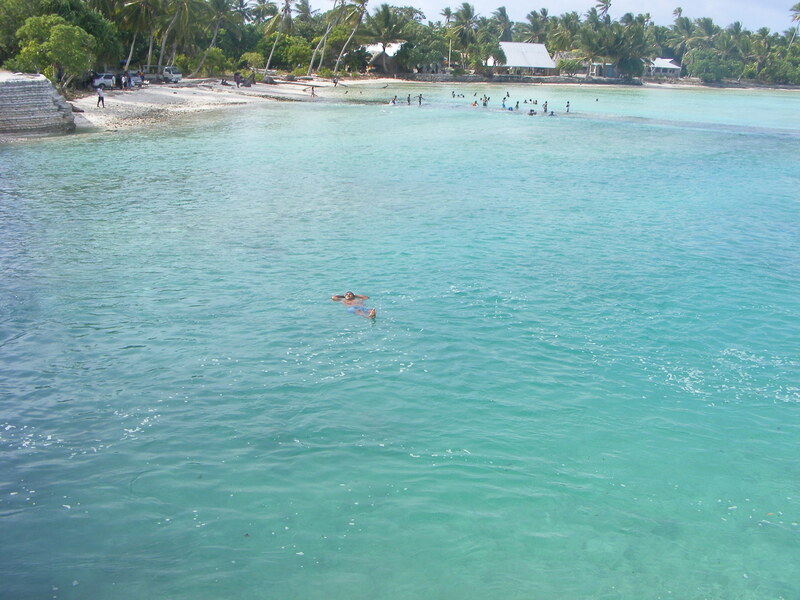 Would you be willing to submit photos from your travels in Kiribati to CultureGrams? Please email me at jenni.boyle@proquest.com if you are interested or have more questions. Hi Jenni, I’ll send through an email now. Thanks for reading! I am an Australian volunteer on Tarawa with Te Toa Matoa (& met your dad at the airport when TTM left for Bris-Melb and told him about the Darebin gig), so very happy that you went along to support and see them. I found your thoughts about I-Kiribati people laughing where very useful, thank you. As an Imatang it takes some time to work out where laughter fits in the I-Kiribati culture, especially around things/issues that don’t seem to warrant that response. This afternoon some TTM members and I have just got back from an outer island trip where they did various music performances and a drama around the elimination of violence against women. I have struggled to make sense of the laughter that comes from the drama (which include scenes of family and personal violence), but am learning the difference at to what it is that is being laughed at and how that sits alongside the core message that is being portrayed. Individuals disability is also laughed at (and will continue to be laughed at in the future), but there is no doubt that over that past 6 days the TTM members won the audiences over with their talents & abilities and are challenging the attitudies and thinking towards PWD here on the ground. I feel very privileged and to be sitting alongside the TTM members and I also look forward to reading more of your posts and hearing your thoughts. Thank you very much for your kind words! I’m glad you found my piece informative. I know that I have grown up with a laughter being a first reaction to many things that don’t necessarily warrant that in western culture – and this laughter is somewhat confusing for imatungs. For islanders, laughing is such a natural reaction for so many things – confusion, compassion, fear, love, disbelief etc! I personally think though that only good can come out of things when you laugh at it first – maybe it’s setting yourself up to look at things in a positive light no matter what the issue is? Just a thought but I do know that the I kiribati people are much happier a than others! I hope you’re having a great time over there, I’m certainly missing it.